Category Archives: CarAds Christmas Edn. A fine selection of some of the best Christmas car commercials. “It is a machine so unlikely ever to be real, it may be a unicorn” – Richard Hammond Top Gear. 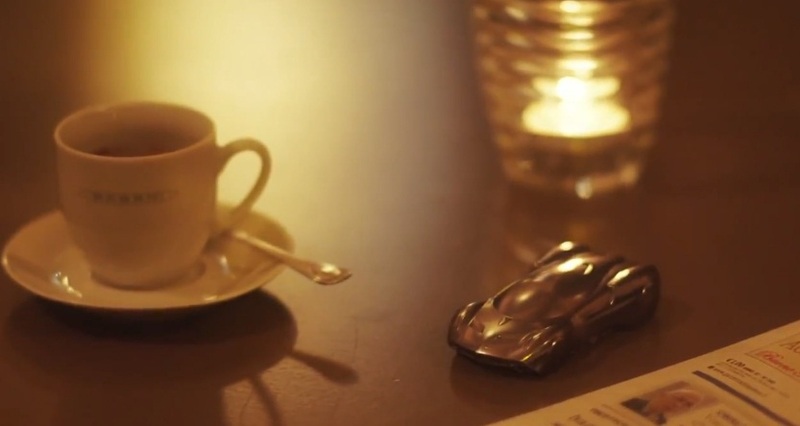 Ending this years category of Christmas commercials is this nice, soft, powerful and simple ad by Pagani for there majestic Huayra. This is not an ad in the proper meaning of the word. It is more of a tribute, a tribute to Modena Italy, the city were this new breed was born, a tribute to its creator the famous, 5 diamond engineering award winner, Horacio Pagani. This chill tribute drive to the Concerto cafe in Modena was achieved by a 700hp 6.0 liters twin-turbocharged AMG V12 hypercar. Yes for me it is the Ultimate hypercar, the ultimate dream machine. It is the combination of the work of the worlds finest, exhaust and body designers and engine and brake manufacturers. Presenting the car that is replacing the Countach in every child’s room, the famous new breed of bulls by Lamborghini, the Aventador. This new jet car is powered by a 6.5 liters V12 engine delivering 700hp and 690 Nm of torque. To put this power down on the road the Aventador is equipped with Lamborghini all wheel drive system: The Haldex generation IV which is an electronic AWD system that allows the car to send different amount of torque to each wheel for a better traction. 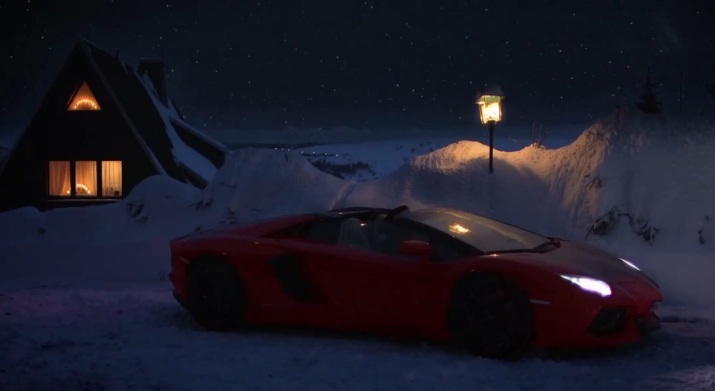 This commercial is very similar to the print ad by Porsche of their new Carrera 4s stating: “In case you’re wondering how Santa Claus delivers presents around the world in one night…it has to do with the power of all-wheel drive.” The idea of the commercial is simple and the execution is basic, just a nice and quick way for Lamborghini to wish all of you guys a Merry Chirstmas! How about waking up this morning and finding in your garage two huge red boxes like those. 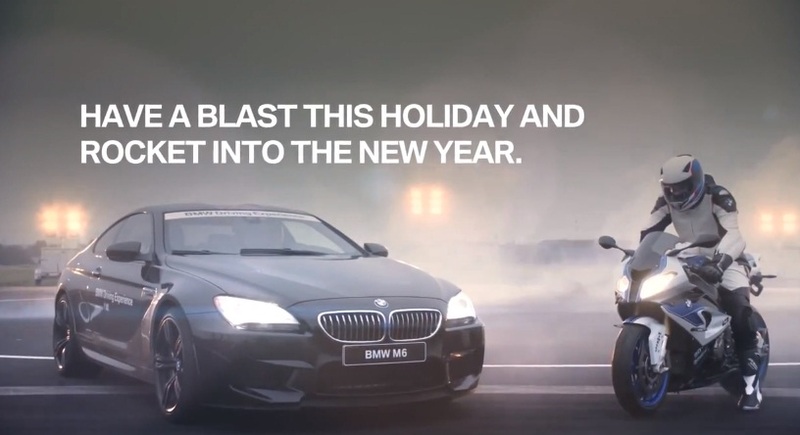 This commercial by BMW is just explosive. I really like this type of commercials, power, engine noises, drifting, and a nice slogan at the end. It features two of there latest babies, the M6 GranCoupe and the HP4 motorbike drifting all over the place. The M6 features the brand new twinturbocharged 4.4 liters V8 engine that delivers up to 560hp and 680 Nm of torque. This new M car is gonna be equipped with the M Double Clutch transmission that allows it to accelerate from 0-100 km/h in 4.2 seconds. About the HP4 now, HP stands for High Performance in the BMW dictionary. This fourth edition has the same engine performance as the S 1000 RR, 193hp and 82 ft-lb of torque. The difference is the weight that has been reduced to only 169 kg. MINI Commercial: Longest Wish list to Santa. For this Christmas MINI decided to break another Guinness World Record, the one of “the longest wish list to Santa”. 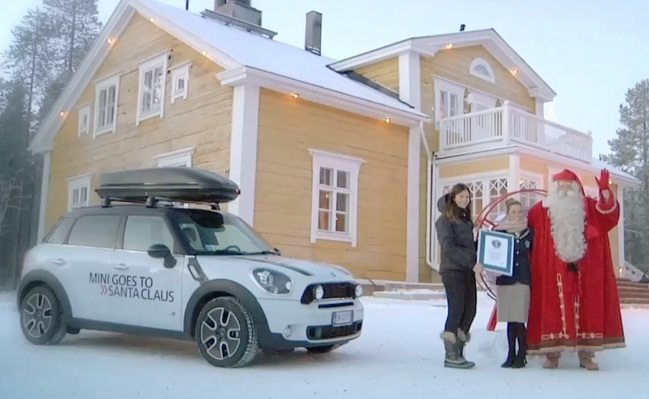 The MINI team traveled 3,555 km in several Countryman, and asked people they met on the way to fill up wishing lists that were gonna be delivered to Santa. The trip started in Milano, Italy and ended in Rovaniemi, Finland the town of Santa Clause where the Record was confirmed by juries of the Guinness World Record team. Santa Clause himself was surprise by the number of wishlists they had brought to him! MINI must have an amazing marketing team! Presenting the BMW M135i, one of the hottest and fastest hot hatches available in the market nowadays. It is powered by a 3.0 liters V6 twin turbo charged engine that delivers 320hp and 450 Nm of torque. This sport version of the 1 series will be available in rear wheel drive and in xdrive all wheel drive. This 2012 135i M will be the first 1-series to feature AWD. Now for Christmas, the BMW team will be trying to sing you a Christmas song while riding with Martin Tomczyk, the professional DTM driver, in the brand new BMW 135i M. The result? Well the fastest song in the world! I am launching this new Christmas category with this great commercial by AMG. I have already discussed the SLS GT3 AMG on TheAdsGarage (click here to access the post). I really liked this advert, a very simple and nice way to wish all of the AMG fans a Merry Christmas and a Happy new year 2013. For this commercial, a part was added to the great 6.3 V8 SLS GT3 engine, a part that makes all the difference. The AMG team have been working hard to make sure it will fit on the big V8. Watch the video and find out! New Speed Regulations in Lebanon? Abdo Feghali vs Mohammed Al Attar | Red Bull Failaka Showdown!